Get the best of link building! We decided to put together all link building techniques we could think of. We currently have more than 60! Your feedback and ideas will be highly appreciated. Let’s work together and make this ultimate checklist useful for as many people as possible. Skyscraper is almost a legendary link building technique. It’s time-consuming, but if it’s done properly, you’ll get quality backlinks, targeted traffic and possible business connections. It’s a combination of perfect content, research, competitor backlink analysis and email outreach. The process is covered in this link building guide. The hardest, yet the most efficient technique. Create content that will naturally attract readers, social shares, and referral traffic. 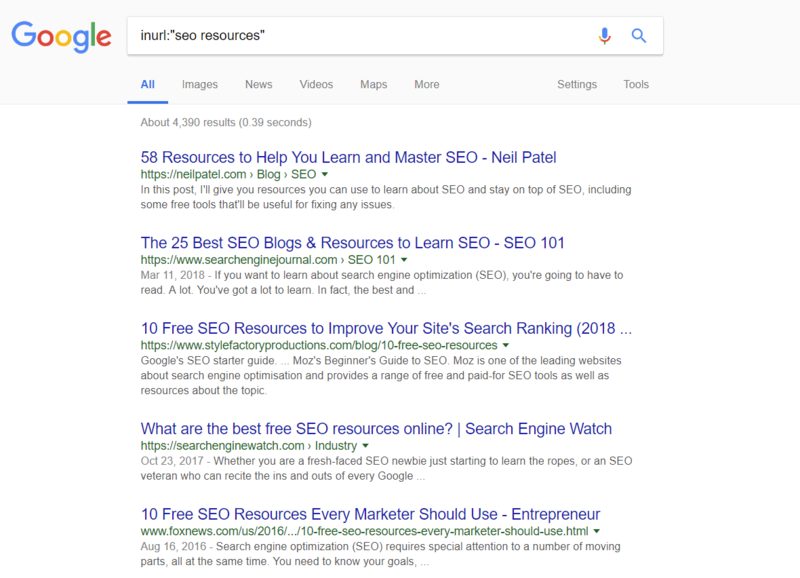 Get inspired in our Learn SEO guide. When you write, pay attention to readability. Content has to be well-structured and without grammar errors. There are many tools to help out. 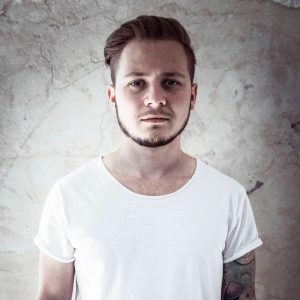 ShoutMeLoud made a nice list. Watch out for flow, adverbs usage, passive voice index, unique words, or estimated reading time. Of course, this depends on your target audience. There are many, but if you have unique and relevant data it should be a success. 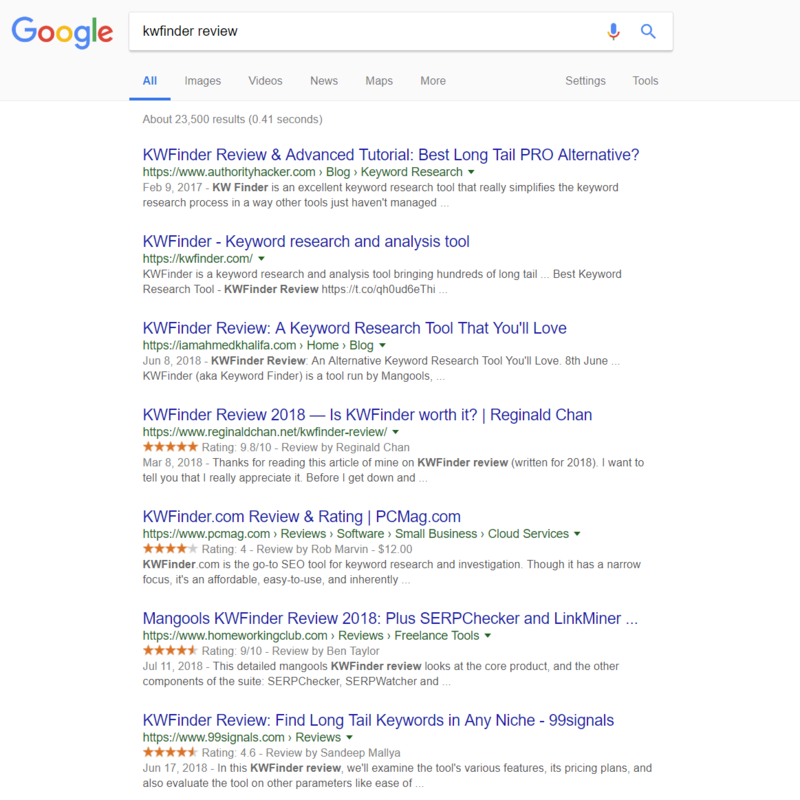 When we published the Top keywords list, it was our most visited blog post in 2016. When writing top lists, think about timing and prepare to dig deep into data. Google SERP is full of “How to” articles. Publishers think it’s easy to educate. Well, it can be, but the amount of recycled content out there won’t attract readers just like that. On the other hand, you can always target a specific group of people with your own opinions and unique insights. Case studies can be a backlinks gold mine! That’s why I’ve dedicated a special point to them. Case studies are always unique and bring new information. Make sure to have proven data, do your research, try to experiment and test industry myths. Yes, it’s a content, but very specific and beneficial when it comes to gaining high-quality links. If it’s good enough and deals with the most up-to-date issues, not only environmentally-friendly organizations will share it. Environmental threats such as climate change, water pollution or species extinction have been discussed widely for years. Who knows, maybe you will become an influencer who will help to save the Earth. This can be tricky. It can ruin your reputation when done wrong. Don’t try to abuse people, their struggles, and opinions. Help them to solve their issues. Be careful on what you plan to profit. I recommend reading this article by Sean Hodge. They’re widely used in the B2B world but you don’t need to be a corporation to conduct a deep research in the industry, add your thoughts, charts, and knowledge others can benefit from. White-papers are a great source of sharing opportunities and gaining valuable links. These two rank very high when done right. Your deep analysis, pros, cons and recommendations will solve decision paralysis of many readers. What’s more, if you’re good enough, businesses will be willing to pay for reviewing their products. And suddenly, you can be a thought leader. There are many companies with useful content despite not having a blog. It’s time to use that potential! A dedicated blog is an engagement magnet. Make sure to go through this very detailed guide on how to learn blogging if you aren’t sure how to start. This infographic on how to start a business blog is extremely useful as well. Try to partner with well-known authorities in the industry. It doesn’t need to a superstar. The person will share the interview with their audience and might link to it on their website too. Guest posts represent a good way to earn backlinks. Do website research, write outstanding content and try to publish it on an authoritative website. They usually have strict guest blogging guidelines and it sometimes takes a lot of time to accept your submission. It’s a bit more time consuming, but it definitely works. You will find lists of websites accepting guest posts but if you plan to target relevant ones, use Google search operators. 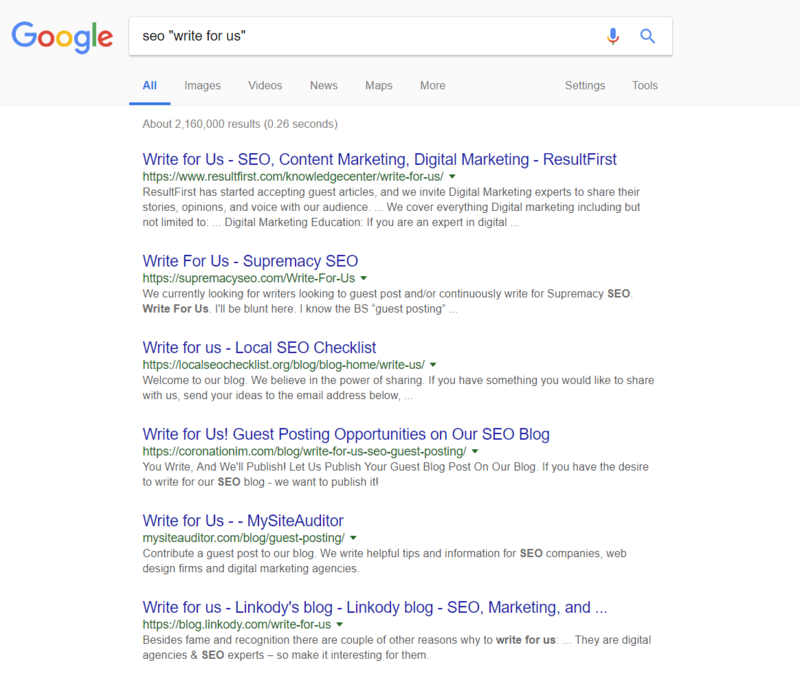 Start with the focus keyword and add “write for us”. You can specify your query with the operators: allintitle, intitle, inurl to find even more opportunities. Make sure to do a proper guest post outreach and focus on the quality of your email – it may be your only chance to get the attention and earn a backlink. And now from the opposite point of view: If you publish a guest content on your site and the same blogger publish another content on a different site linking to the original article on your site, you’ll have a backlink. Share your content on social media, promote it on Facebook, Twitter, Linkedin, comment relevant posts and create connections. I love these 4 powerful social media outreach tactics. Sharing buttons and widgets. You can’t skip them on your website. Besides sharing your content via social networks, people can place your widgets on their sites and link back to you. AddThis is a useful plugin in which you can track the results of social engagement of your website. Give your users an opportunity to access exclusive materials, bonuses or discounts by asking them to share your website. Motivate them to share your stuff. We use Social Locker. Join Quora, Reddit, StackExchange, and others to ask and answer related questions. Be careful, these forums usually have strict spam rules and are full of professionals, so you can suddenly get banned. It happened to me as well. I should have read this guide before. Forums, Q&A sites, content aggregators, etc. You can add the link there, but keep in mind that majority of them are low-quality links, usually no-follow, so their benefits are questionable. Yet another interactive way to gain not only social exposure. We did it some time ago and the response was fantastic. 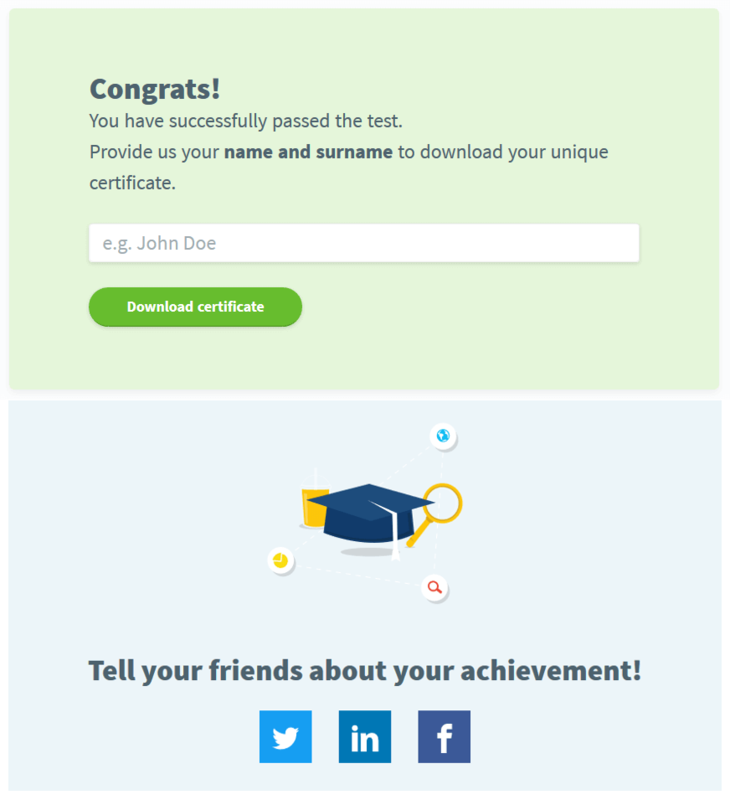 We added a certificate of completion to motivate people to share their success via their social profiles. Though we made it on our own, you can use many tools such as SurveyMonkey. … and tag them in your social posts. It might not work for the first couple of times, but sooner or later they will notice you. If your content is good enough and relevant, they may link back or at least give you a shoutout on their social profiles. Besides gaining a relevant link you have a promo for free. We were a part of a couple of giveaways and they generated subscriptions, as well. Research on-going contests and giveaways and contact the organizers. Sometimes, these offers land in your inbox so you won’t spend any time. Everyone loves discounts and discount codes! And it’s a great motivation to share your product, too! Moreover, discount coupons are great for additional affiliate program promotion. Leaflets, stickers or even guerilla marketing. Don’t forget where it all began. Creative marketing attracts people. They will talk about you and might link to your site. PR articles written by professionals and published on sites with high authority will give you high-quality links too. But prepare some budget for this. Think about products you use, get in touch with people behind them and write testimonials to be published on their websites in exchange for a link. You’ll need to write a couple of emails and reminders but it can be very beneficial. 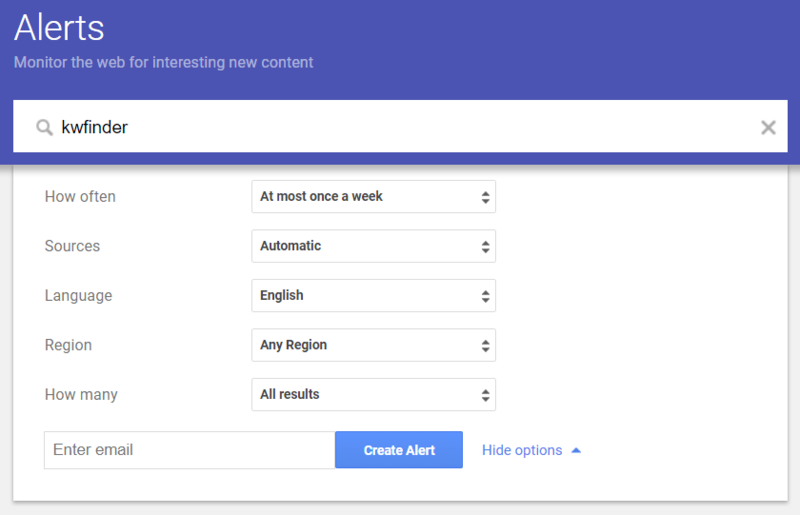 Google Alerts is one of those tools we all heard about. However, not many of us use it to find brand mentions. Setting up the alerts is super easy. Select the term(s), choose from the listed options and add a valid email address to receive the alerts. In our case the terms could be “kwfinder”, “kw finder”, “kwfinder.com”, etc. Yes, why not? Reach out your family, friends or people you know for a link. They might be willing to link to your site if it’s relevant and fits the context. Don’t try to link to a marketing blog from a clothes e-shop. It’s similar as the previous technique, but this time you will have to pay for it. On the other hand, it won’t cost you almost any time. If you plan to be a writer and get paid, don’t forget to check these blogs that will pay you. It’s one of the techniques that do not work anymore and have a bad reputation. You’ll gain both links and revenue. Our affiliate program is one of the strongest sources of revenue, exposure and high-quality backlinks. There are many affiliates searching for a new source of income. 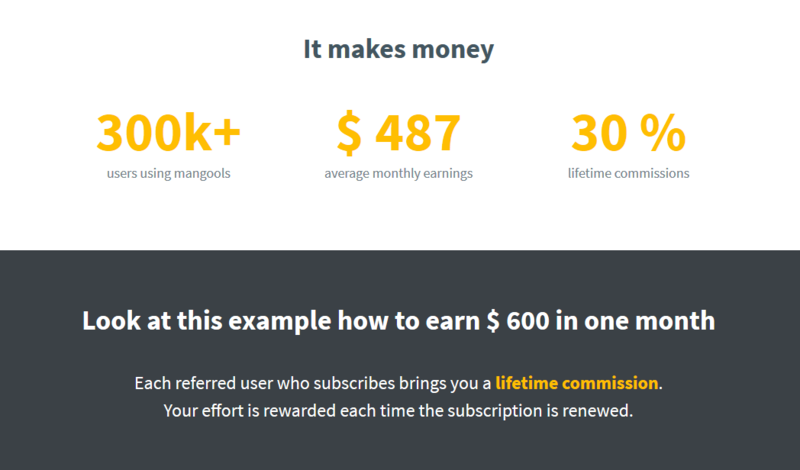 Don’t forget to prepare attractive commission system. We mentioned our affiliate program is beneficial for us, but that’s because it’s attractive for our partners. As an affiliate marketer, you can earn a lot of money on commissions and your product reviews or comparisons can generate many backlinks. Tung from cloudliving.com trains people to become successful in this field. Spy on and analyze competitors’ backlinks. You can focus on those you can replicate easily to save some time. Using search operator “brand name” -site:brandname.com will help you to find mentions of your brand. You need to check whether each mention is linked to your site. If not, contact these people to do so or to adjust the anchor correctly. I noticed that many websites mentioned founders or CEOs without linking to the company. Use this as an opportunity to thank them for mentioning you and for acquiring another link from a relevant source. Technically, the link reclamation is when you try to locate broken backlinks, opportunities mentioned in #30 and #31, or if there is an improper backlink, misspelled domain or anchor text for any reason. When it comes to images, it may happen some websites use your images without providing a source. It usually applies to infographics, charts and quality images. Last but not least, this technique makes sense for authoritative websites or if your images are true inspiration for the others. Check the websites from search results whether they gave you a credit by looking for your domain in the HTML code. If there’s no credit, reach out the authors. No, you don’t need to be Britney Spears. Things happen really fast in the digital world. Take the advantage of it. You can become successful in a short time so getting interviewed with a link is definitely a good idea. However, nothing comes for free so don’t wait to be interviewed. Research publishers and get in touch with them. This is a detailed guide by Ann Smarty you should go through. How about sending gifts to your most valuable customers and partners? Use special occasions such as Christmas or birthdays and include a call-to-action to share it and link to you. Exchange your products for a review or other promo activities leading to a link. Bloggers writing a review will usually include a link so you don’t need to ask them. When it comes to affiliate partners, they tend to provide no-follow links. Do you have a special discount, an event or a product launch? Build a microsite! Keep in mind that content should be 100% non-duplicate and you should also build a good link profile for the microsite. Creating microsites from the SEO point of view isn’t as profitable as it was in the past but you should consider it when you are planning to build a long term authority website. Yeah, a sitewide link isn’t that good when it comes to the link strength but it’s perfect for a short term link placement to gain high traffic, i.e. you can do this with a short term special offer. Keep in mind that the linked sites should be related. In general, I think that comments with links don’t positively influence your SEO because they are deleted almost immediately. But if you select blog posts with high traffic, then you write a comment which is super relevant and boosts the discussion, it may end up with providing a link that will add a value to the discussion. In this case, the moderator shouldn’t delete the comment. No one wants to stop a productive discussion under their blog post. What’s better than to be recommended to many students by well-known courses, universities or respected teachers? Not to mention that a backlink from “.edu” domain can be a great signal for Google. The quality of website users referred this way is unquestionable. The amount of time you will need to invest into this depends on whether you are the outreached person or you plan to outreach them. You can submit an excerpt of your original article or create a unique description, it’s up to you. In case of the duplicate content, make sure to check whether the platform has implemented a “rel=canonical tag”, which links back to your original content. Compared to the time neeedd for a video production, the submission is nearly nothing. And it’s not only about YouTube. There are many sites where you can attract views such as Vimeo. Once you create a list of the pages, prepare personalized messages and outreach the authors. Creating this kind of content attracts links so why not to have a backlink there? This technique is similar to #44 and it requires using the exact match, allintitle, intitle, inurl search operators. When creating the list of prospects, think about your website’s authority too. You should provide a value for the outreached person. Besides using the search operators, you can try tools such as BuzzSumo. How many emails do you send per month? Imagine only a few of the recipients click on the link under your name. You get a couple of clicks and it costs you nothing. 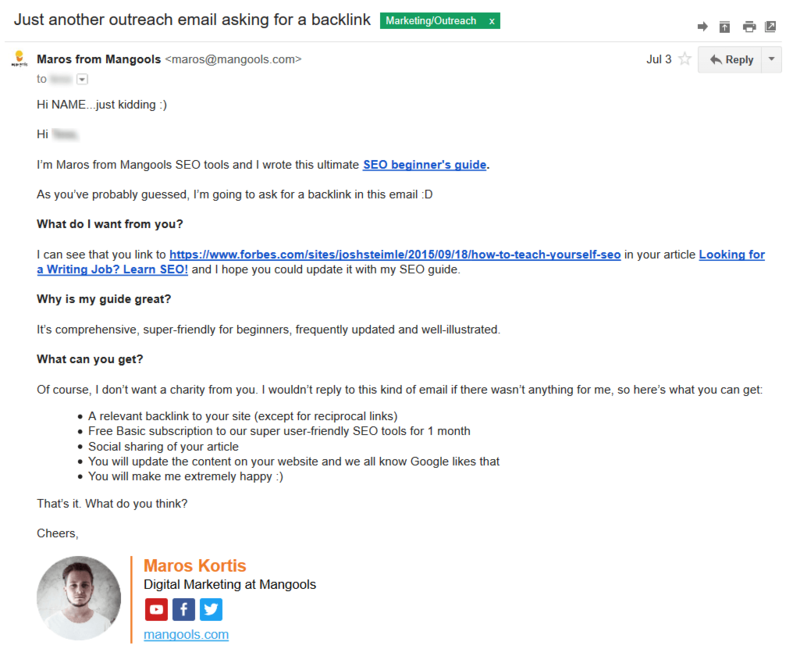 Keep in mind that email signatures don’t positively affect SEO. It’s a must! Internal linking means you rule anchors and add links where you want to. If you do it regularly, it’s a matter of seconds. In case your website is full of content without internal links, you’ll spend a couple of days fixing it. Before doing so, I recommend reading the Essential guide to internal content link building by Julia McCoy. My advice: Don’t add more than 2-3 links per article. Avoid using a plugin which automatically links particular words. It’s annoying and ruins UX. One more tip: Identify your most-viewed pages so you know where to put specific links. Another internal link building tip is to use breadcrumbs. The site navigation is transparent thanks to them and you can optimize the anchor text distribution as well. You probably have it but in case you don’t, create one. Sooner or later, somebody will scrape your content. But if you place internal links in the content, you’ll earn a link. This is one of the internal linking methods and it’s extremely useful. Search engines like sitemaps. Moreover, it’s a good navigation for visitors. You can use one of the many WordPress plugins. Identifying links leading to non-existing sites and linking them to your content can be a time-consuming but effective method. You can use search operators or various tools for this. This Ahrefs guide will help you with broken link building. Check the Google Search Console if there are any. No one likes to land on 404 – Page not found. 59. Do you have robots.txt? Review it whether there are any linked pages. Either contact webmasters of sites linking to them or consider allowing crawlers to index these pages. PBNs are a way as well but you have to be very careful. These links should look as natural as possible. PBNs are websites to implement links to other websites (ones that generate money). It’s an expensive technique. You need to pay for a domain, hosting and set of blog posts. It can be risky because Google bans PBNs from time to time. Think wisely. The costs of PBNs can be higher than the income. That’s why I’d recommend reading the guide by Lion Zeal. Look for expired domains with working links. All you had to do in the past was to find them and redirect them via 301. Nowadays, it’s more complicated. Watch out for relevancy. Everyone loves free tools: free = buzz. That means it’s shared and likely to build a solid number of backlinks. So why not to create a free tool to use this potential of high website traffic and many backlinks for your own needs? You can link your other websites from it. We did the same thing with RockingPage where we included links to our SEO tools. What other link building techniques come to your mind? Share them in the comments below and we’ll update the post. 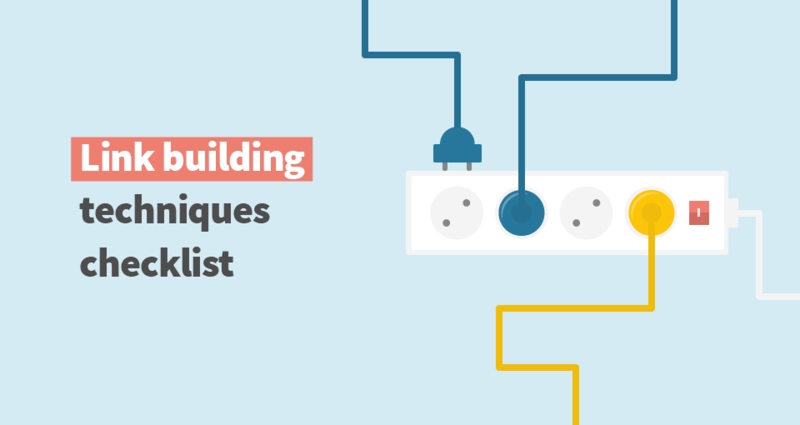 Just in case you are absolutely new to link building, you can check this beginner’s guide.